Salads can be packed full of valuable nutrients, depending on the variety of vegetables you put in them. Also, the amount of calories in your salad can vary widely because of the type of cheese, dressing, nuts and protein you may add onto it. A study of 17,500 people, conducted by Louisiana State University and UCLA, revealed that regular salad eaters have higher nutrient levels in their bloodstreams than non-salad eaters, according to sciencedaily.com. Sciencedaily.com reports that the 17,500 study participants had high levels of vitamin C, folic acid, alpha and beta carotene, lycopene and vitamin E, thanks to the raw vegetables in salads. The more raw vegetables your salad has, the more nutrients you will gain. Also, green leafy vegetables, such as spinach, have more vitamins and fiber than iceberg lettuce. A typical salad can instantly become less nutritious if you add a fatty dressing. For example, spicypickle.com states that a typical ranch dressing contains 11 grams of fat. Instead, opt for a low-fat dressing or vinaigrette. Fat in salads can also be attributed to nuts and cheeses. 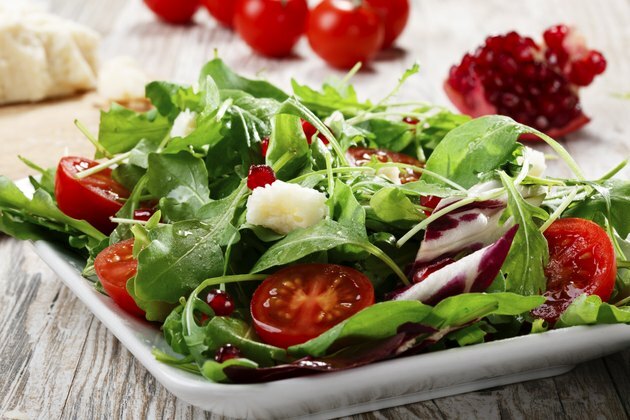 Salad can be a calorie-conscious lunch choice. According to spicypickle.com, a small Caesar salad contains 140 calories, a small tuna salad contains 130 calories, a small Greek salad has 110 calories and a small spinach salad contains 220 calories. These figures do not include the dressing. Can You Lose Weight by Eating Salads & Fruit Only?